After reading Every Day, I just didn't think there needed to be more to the story. I liked A, I liked his story, I liked that we were left "up in the air," just as A is every day. I don't think we need closure, because in a life like A's, I'm not sure there's any to be had. That being said, I enjoyed Rhiannon's point of view regarding their "relationship." I liked the juxtaposition of A's life and how it rubbed against and generally caused turmoil in Rhiannon's. When all you knew was A's POV, it wasn't possible to understand, really, how his constant "make overs" affected someone else. Again, there was some melodramatic stuff (typical of any teenager) and a bit too much waxing philosophic, but the story holds itself together well. It was important in this story to show Rhiannon's life away from A, and the affect his unplanned entrance into it had on her even when he wasn't around. 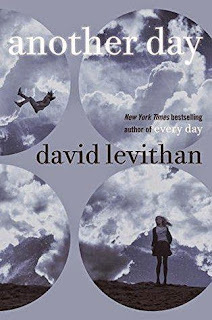 Another Day is a companion to David Levithan's novel Every Day. It's a companion book, not a sequel. This book isn't continuing the story, it's telling Rhiannon's side of it, and if you'll recall, A met Rhiannon one day and stayed in touch with someone for the very first time. Disclosure of Material Connection: I purchased this book for my own enjoyment. I was not required to write a positive review. The opinions I have expressed are my own.